Discussion in 'Official News & Announcements' started by MightyZug, Aug 23, 2017. UPDATE (9/4): 1.4.1 is now LIVE! UPDATE (8/30): 1.4.0 is currently in QA with LINE. Final release date is TBD, but the most likely release dates (pending LINE then Apple approval) is either Friday (9/1) or Sunday (9/3) PST. Looking forward to releasing it ASAP! The new 1.4.0 update will be going LIVE within the next couple of weeks. Notes on the changes you can expect below! Now, every day that you login, you get a free reward! UP NEXT: Painwheel, Valentine, and many more! Every other week, one day will feature a 24-hour Medici Event (ex: Medici Heist) that offers the same amount of Canopy Coins as a Medici Shakedown event, but in half the time! This is NOT intended to be the be-all-end-all solution to BB3 balancing, but rather a short term step in the right direction pending other adjustments. Stay tuned! After successfully blocking a BB, enemies should block for the remainder of the BB. This was most noticeable versus moves like Argus Agony, where the AI would block the laser, then charge into the “bullets”. Epic Sax’s Circular Breathing SA can now trigger "Heavy Regen"
Poringsmasher, MXDEX, Zuzuska and 5 others like this. 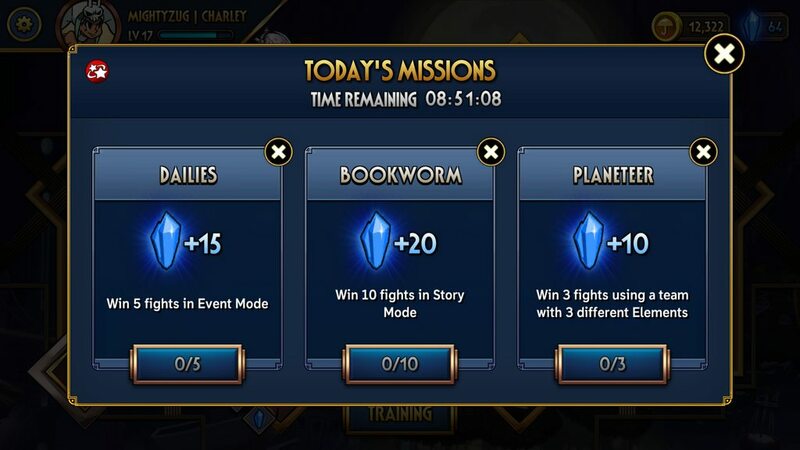 Missions now have their own button on the Main Menu! 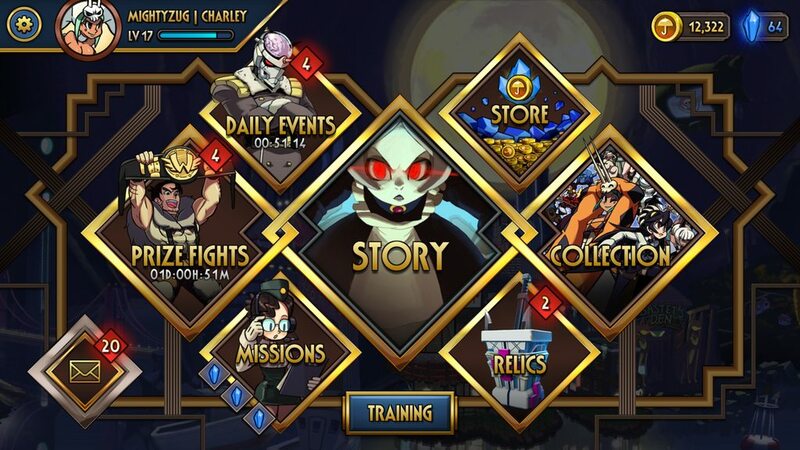 Now includes bios of your favorite Skullgirls characters! ShadowSpider, Tujae, Poringsmasher and 10 others like this. This is the first major "1.x" update without adding a new playable character. But it looks like it will be just as great with all these improvements and fixes to make the game more fun and fair. Hoping Ms. Fortune is up next! ShadowSpider, Tujae, Adrian Uribe and 8 others like this. 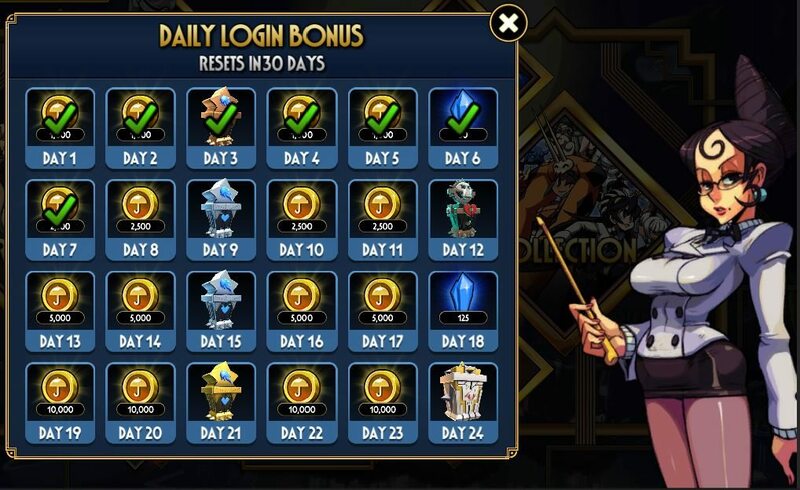 Daily logins and the streak preview is a nice add on to the game. Something I would like to see added is an option to sell a move when you obtain it, instead of having to go into collections. And you've already mention that the next next update may have stat previews for moves when we get them. Thanks for the update and the game. Edgewheel and MightyZug like this. 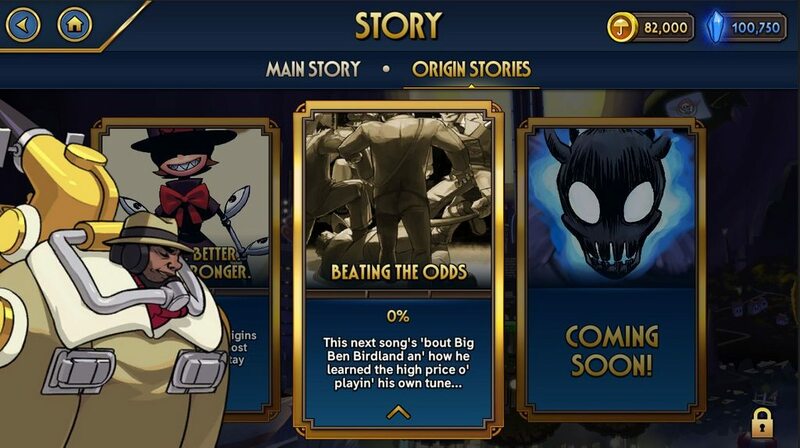 Will the last hit of fracture reaper connect with big band now? I'm assuming the new Daily Login Rewards replace the daily relics? 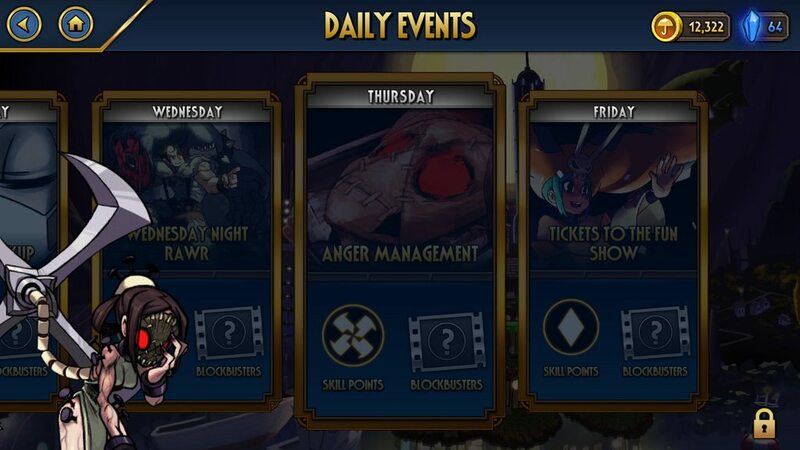 If so that's definitely a great improvement to make daily login more worth it, though personally i still don't have much use for bronze moves and silver moves, so i'd like to see some alternatives for players with a higher player level in the future perhaps. Definitely promising. Daikodugo and Cellsai like this. With the changes to Merry Go Rilla and Georgie's Day Out: does this mean the moves will deal less damage in 1.4.0 than they do now? Will they be getting a chance to add a debuff as compensation? Right now, every character has a special move that has no chance to apply any debuffs but does medium damage. Is every character going to get those kinds of moves changed? If not, why are Cerebella and Peacock specifically being changed? Whoo! I took a break from playing while waiting for a bug fix patch, but this goes above what I was hoping for! Can't wait to get back into SGM again! Edgewheel, BrolaireOfAsstora and moisterrific like this. As far as that move archetype goes (Med damage moves that deals all its damage in one hit), Painwheel has a similar move (Pinion Dash) which is actually getting a damage boost. Eliza's Throne of Isis is getting no changes. I just am confused as to what it means for the damage tier to go from Med to Low, if that means it will actually change the damage values, and why those two are the only ones getting this particular kind of treatment. Wulf Shoot goes through block, but the notes say it will not be reclassed as a Low damage move (even if it's getting nerfed). That's why I'm hoping they'll comment on my question. I doubt the game has some sort of built in tracker on winrate. Maybe they can pull some data from the servers about which fighters are played more often but that would still be inconclusive when deciding balance. A lot of players complained about the AI being too hard, then they made it easier. A lot of players complained about Sekhmet Mode being too underwhelming, then they made her better with longer hitstun and unblockable charge attack. A lot of players complained about Epic Sax being overpowered, and then he was nerfed. A lot of players wanted more storage space for moves and a way to see streaks in team select. And now we'll be getting that in 1.4.0. With the changes to Merry Go Rilla and Georgie's Day Out: does this mean the moves will deal less damage in 1.4.0 than they do now? Both moves got nerfed in the last patch and I think they're just updating the label now, this is mentioned in the notes before the character specific stuff starts. Damage was reduced because they were widely regarded as being too good. Cymbal clash was the other too-good move but it got its stun rate reduced instead of damage. Sounds like she still has them on startup, changelog only mentions punishing its recovery. Huh, really? I use Boxcart George, but then I'm not sure I follow conventional wisdom on what moves to use with some characters. If it's just a label update, I guess I'm ok with that. Honestly if the last patch saw those moves nerfed, I hardly even noticed. I will say, though, that it will bug me that only two characters will no longer have a move of the "Med damage, no debuff" archetype, but I guess for balancing it's good. Correct, she still has strike invincibility during the startup of MGR. Zuzuska, Boogiepop and Ryouhi like this. It's strange they choose to buff really weak skills like Dead Cross by 5% and kinda funny they are calling it a "game changer", i get it. So is it a new character every 2 months now?